DEPEW, N.Y. - We don't know the score, but Prime Minister Stephen Harper was spotted Tuesday playing a round of miniature golf in New York state. Harper and more than a dozen guests reportedly dropped by at the Broadway Driving Range and Miniature Golf Course in Depew (deh-PYOO'), outside Buffalo. 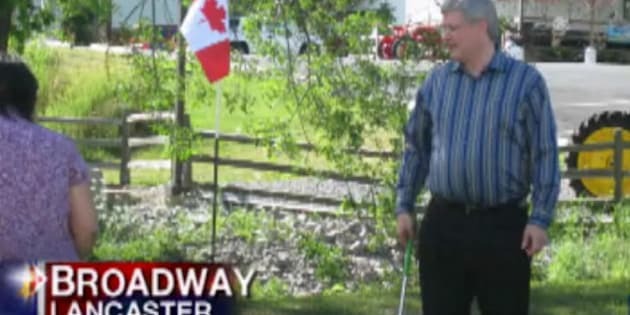 THE CANADIAN PRESS — DEPEW, N.Y. - We don't know the score, but Prime Minister Stephen Harper was spotted Tuesday playing a round of miniature golf in New York state. Harper and more than a dozen guests reportedly dropped by at the Broadway Driving Range and Miniature Golf Course in Depew, outside Buffalo. Owner Tom Straus tells YNN cable news in New York state that he was notified a day earlier that an important dignitary planned to play at his course. Straus said the prime minister paid for his group's round of golf. He also stopped to pose for pictures with other customers. Two girls got his autograph. Straus told the station that Harper was in the Buffalo area on personal business and was travelling with family members. The Prime Minister's Office said today Harper took the family on a day trip where they played some mini-golf, had lunch and enjoyed the day together. Harper was in Brampton, Ont., today for a ceremony in honour of Korean War veterans.